Few online slot machines come as simply designed as Novomatic’s Sizzling Hot slot. The imagery in this game is predictable, but it is also wonderfully drawn. If you were expecting to find modern 3D imagery, you may be surprised. 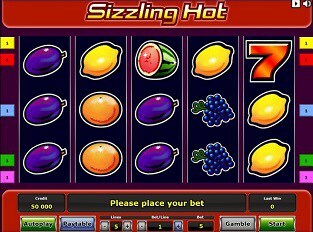 Sizzling Hot showcases the same classically drawn fruit symbols that you would expect to find in any land-based one-armed bandit or pub fruit machine from the 70s or 80s. There is a touch of retro about the look of the Sizzling Hot slot and it is marvellous. Whilst the Sizzling Hot slot certainly looks the part, it does want for features. Novomatic are renowned for being very samey when it comes to the design of their simpler slots. Truth be told, there is precious little to differentiate between this title, and other pub fruit/one-armed bandit slots developed by them, save for the imagery. Once again, we must say that Sizzling Hot looks the part, but that’s where the compliments end. Players should have no problems getting used to the gambling style in Sizzling Hot. There are 5 reels and upon those 5 reels are 5 paylines. None of those paylines are adjustable. By using the overly plain and simplistic wagering menu bar located below the reels, players can select line bets which range from 1p up to £15. This, in turn, will see players wagering anything from 5p up to £75 a pop on this slot. Scatter symbols: Although there are no wild symbols present in the Sizzling Hot slot machine game, there is a scatter symbol. It appears as a golden star and can count no matter where it falls on the reels. Bagging three of these anywhere on the screen will see a cash prize paid out to the player. As you may have guessed, you aren’t going to be able to walk away with multi-million-pound cash prizes from the Sizzling Hot slot machine. There is a theoretical return to player rate of 95.66% and that’s not too shabby at all for a slot with few paylines and virtually no features. The top prize in the game is worth 100x your total bet, and that’s about as good as you could hope to expect from this Novomatic developed slot. It may seem as though that after a bright start, things went a bit downhill with Sizzling Hot. Truth be told, that is exactly the way it feels to play this slot. You start off with a gorgeous looking, old-school slot, and before too long you realise that there is a distinct lack of features or manoeuvrability in the game. The best way to sum this slot up is by saying that it is a modern day, video slot based on fruit machine gameplay. If you like your fruit machines, there’s reason to believe that you’ll find Sizzling Hot right up your alley. If you love the modern-day video slots with plenty of features, flexible paylines, flash graphics and progressive jackpots, Sizzling Hot just doesn’t cut the mustard.